Enrique Iglesias The Best Hits. 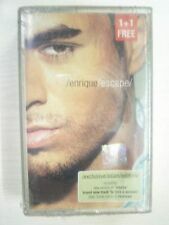 Enrique Iglesias - Cassette New! 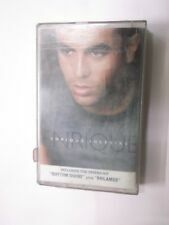 Enrique Iglesias ~ Self-Titled Cassette Tape. Cassette is in VERY GOOD condition with slight wear from normal use and NO CRACKS. The case is in VERY GOOD condition with NO CRACKS. (see photos). Enrique Iglesias. Latin Music Cassette Tape. We Are Adding New Things To Our Closet Daily. Stop In - Dig In! See What You Can Find! Dog Clothes. Elvis Presley. Shoes, Handbags, Wallets. Enrique Iglesias - Bailamos - Cassette New! Sealed! Rare! Enrique Iglesias - Bailamos - Cassette New! Música 🎵 música 🎵 música 🎧 para coleccionistas un Cassette con hermosas canciones. 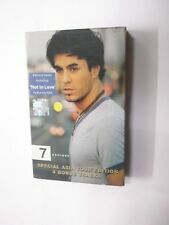 Enrique Iglesias - Cosas del Amor - Cassette New! The cassette shows signs of normal wear and tear. USED, Acceptable conditions. Enrique Iglesias | Quizás (Universal 2002) MC Kassette Cassette Tape (Thai press). Música 🎵 música 🎧 música 🎵 para coleccionistas. ENRIQUE IGLESIAS - ENRIQUE CASSETTE TAPE. CASSETTE TAPE (December, 1999 ). CASSETTE TAPE 1. Condition : Korea Edition, Bread NEW, Sealed. I'M Your Man. it is N ew, Sealed. No Puedo Mas Sin Ti (I'M Your Man). ITEM CONDITION : NEW SEALED FROM FABRIC,NEVER OPEN BEFORE. BOX H TOTAL 1. Enrique ‎– Escape. Cassette, Album, Reissue. B6 Escape (7th District Club Mix). Manufactured and Printed in Thailand. A6 Love 4 Fun. B4 Maybe (Mark Taylor Mix). A2 Don't Turn Off The Lights. Featuring –Lionel Richie. Enrique Iglesias. Love to See You Cry. Love to See You Cry - Album Version. Audio Cassette Tape Single. All Cassette Tapes have been checked and tested to ensure that they. Interscope Label. Plays well but may have creasing, scuffing, marking or fading - any major imperfections will be detailed in the Condition section above. Artist:ENRIQUE IGLESIAS. 1999 Interscope. RARE OOP SEALED CASSETTE. CONDITION: SEALED, security sticker on front over shrink. ENRIQUE IGLESIAS BAILAMOS. FACTORY SEALED CASSETTE SINGLE. FACTORY SEALED CARDBOARD CASE NOT PLASTIC! FACTORY SEALED FROM A LARGE NOS COLLECTION. CRAFTY MIND - Maggotron Featuring Connie A SINGLE. Mint condition, sealed, last copy. Enrique Iglesias. Love to See You Cry. Audio Cassette Tape Single. All Cassette Tapes have been checked and tested to ensure that they. Cassette Tape - Excellent. Interscope Label. Plays well but may have creasing, scuffing, marking or fading - any major imperfections will be detailed in the Condition section above. Title : Bailamos. 1 Bailamos ( album version) 3:37. 2 Bailamos (Groove Brothers Radio Edit) 3:25. Artist/Composer: Enrique Iglesias. This is a genuine CASSETTE - and not a copy. Complete with case / insert as issued. Bailamos (2 Versions). Enrique Iglesias. Audio Cassette Tape Single. All Cassette Tapes have been checked and tested to ensure that they. Cassette Tape - Excellent. Tape plays well with no obvious signs of wear to the cassette shell and/or labels. 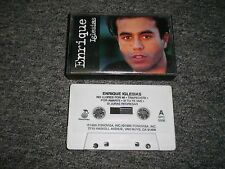 Enrique Iglesias - Enrique (audio cassette). Enrique Iglessias album "Enrique" released on cassette by Russian label Invisible Halahup in 1999. Very rare release. Condition: Used cassette in really good working condition. 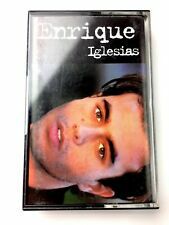 ENRIQUE IGLESIAS-ENRIQUE-POLISH CASSETTE TAPE 1999-LIKE NEW!!!! TAPE IS VISUALLY GRADED ! ENRIQUE IGLESIAS sings in Italian. CASSETTE VG . COVER VG . Enrique Iglesias - Hero / Bailamos. Cassette Tape Single (Interscope INC 97671) in cardboard slip case. Case is a little worn around the edges. MC ENRIQUE IGLESIAS "CANTA EN ITALIANO". New and sealed. AUTHOR : ENRIQUE IGLESIAS. TITLE: CANTA EN ITALIANO. FORMAT : MC. Images shown may, occasionally, belong to a catalog and could vary to the ofered item. Artist / Artist: Enrique Iglesias. A1 - Enrique Iglesias Rhythm Divine. A2 - Enrique Iglesias Be With You. A3 - Enrique Iglesias I Have Always Loved You. A4 - Enrique Iglesias Sad Eyes. A5 - Enrique Iglesias I'm Your Man. AUDIO CASSETTE TAPE. LOVE FROM INDIA. HENCE THEY ARE VERY HARD TO GET. AUDIO CASSETTE TAPE. LOVE FROM INDIA. THEY ARE VALUED MORE AS A COLLECTOR ITEM RATHER THAN LISTENING PLEASURE ! AUDIO CASSETTE TAPE. THEY ARE VALUED MORE AS A COLLECTOR ITEM RATHER THAN LISTENING PLEASURE ! LOVE FROM INDIA.